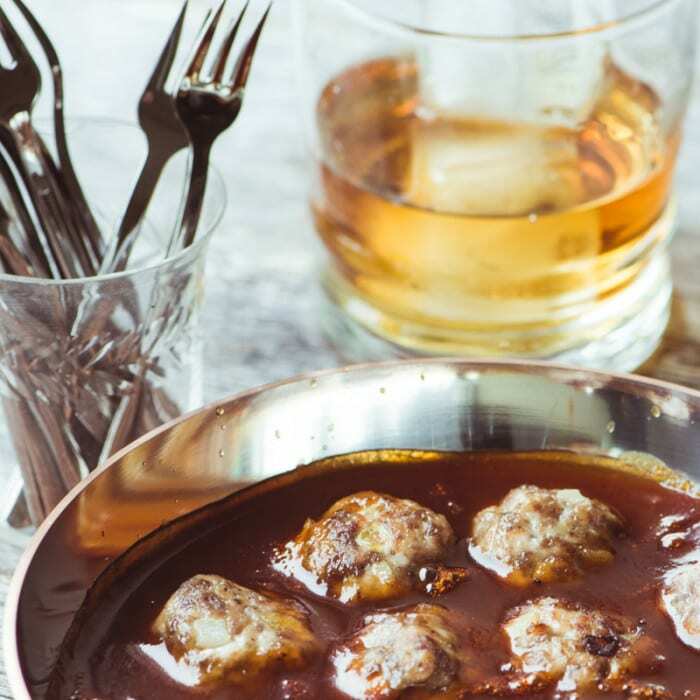 How to Make the Best Bourbon Meatballs Ever! These luscious little Bourbon Meatballs are going to be the hit of your next cocktail party ~ people will flock to the meatballs, but they’ll hang around for the sauce!! 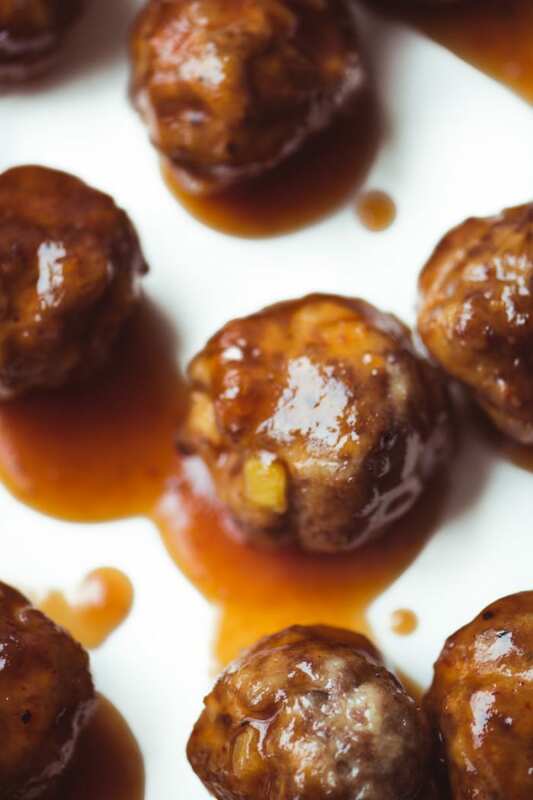 VINTAGE VIEW ~ these Bourbon Meatballs are from TVFGI archives, first published in 2012. As part of a series on the blog I’m reviving some of the best recipes that you may have missed over the years ~ I’ve updated my notes and taken new photos. These spiked meatballs are legendary in our house, I hope you give them a try! 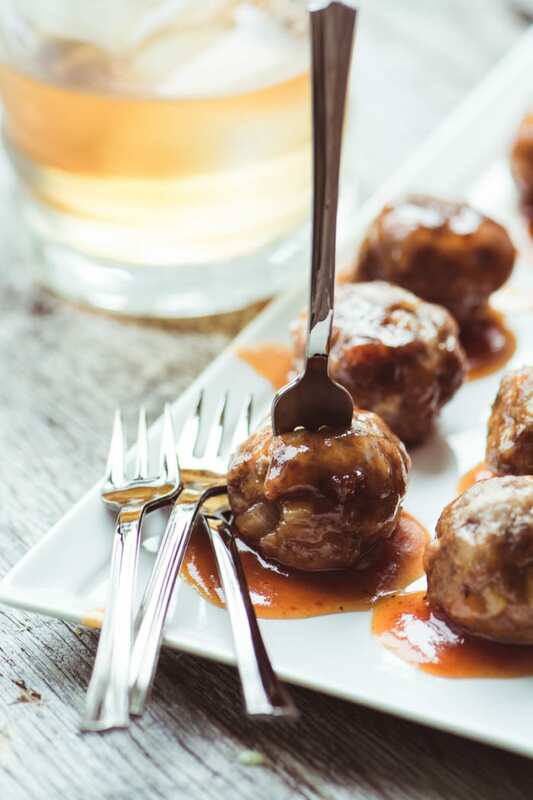 I have to confess, although these Bourbon Cocktail Meatballs are clearly meant to be appetizers, in our family we just as often make a meal out of them. Last night we had them with mashed potatoes and peas ~ so good! The meatballs themselves are moist and tender because I use a combination of ground beef and ground pork. The pork gives the meatballs great flavor, but also keeps them from being dense. I lighten them up even more with my favorite secret ingredient, Ritz cracker crumbs! The sauce for these meatballs is pretty darned amazing, if I do say so myself. It’s thick and glossy, with a hefty dose of bourbon. It’s also got that classic cocktail meatball combo of sweet and tangy, thanks to apricot jam and barbecue sauce. Oh, and there’s a hint of heat from sriracha. Just typing out those ingredients has got my mouth watering. Since Grant drinks Manhattans we always have bourbon and rye whiskey around, and you can use either for the sauce in this recipe. But even if you don’t drink on a regular basis, it’s a good idea to keep certain spirits in your pantry. I consider bourbon and Marsala wine to be pantry staples. I like to collect mini airline sized bottles of various spirits so they’re on hand when the need arises. Who knows when a stew might need a shot of cognac, or a frosting could use a touch of Kahlua? I’ve probably made a gazillion meatballs in my career ~ I’ve spiked them, super-sized them, and even made them with zucchini. I’ve drawn inspiration from all over the globe, too, with my Swedish Cocktail Meatballs, my Greek Meatballs in Lemon Sauce, and my Moroccan Cardamom and Lemon Meatballs. But it seems to me there’s something uniquely American about these mini cocktail meatballs slathered in a thick Bourbon sauce, I’m going to claim these for the homeland. This recipe makes approximately 60 meatballs, so enough for a crowd. But they also freeze well, so you can use half the batch and freeze the rest if you’re not in party mode. TIP: Meatballs can be frozen either cooked, or uncooked. Freeze them on a tray in a single layer until solid, and then transfer to a thick freezer bag or container. Put the meatball ingredients, except the olive oil, in a large mixing bowl, breaking up the meat as you put it in. Mix together, using the tips of your fingers to gently combine everything without compacting the meat. I like to do this in my stand mixer. If you need to reheat these meatballs, do it gently. I put the meatballs in their sauce, cover with foil, and heat in a 350F oven until bubbling. If you do it on the stove, do it over medium heat, and just bring them to a simmer. 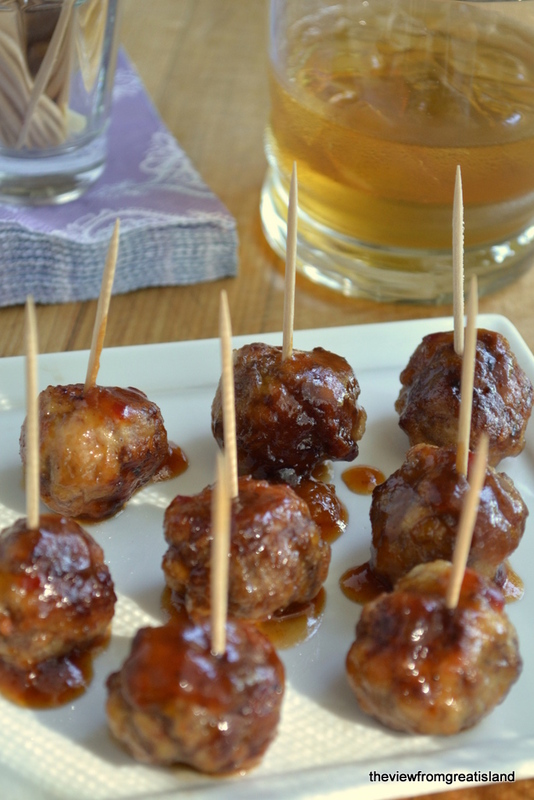 Thanks for pinning these bourbon meatballs! I don’t have any molasses. Can I omit it or substitute it with something? Thanks! I need to make about 500 for the upcoming 2019 Kentucky Derby. About how many does this make? One more thing what kind of BBQ sauce did you use? About how many does this recipe make ? Hey Chyree, this makes approximately 60 meatballs, give or take, depending on how large yours are. Mine were pretty small. Thank you so much I have about 500 I need to make. 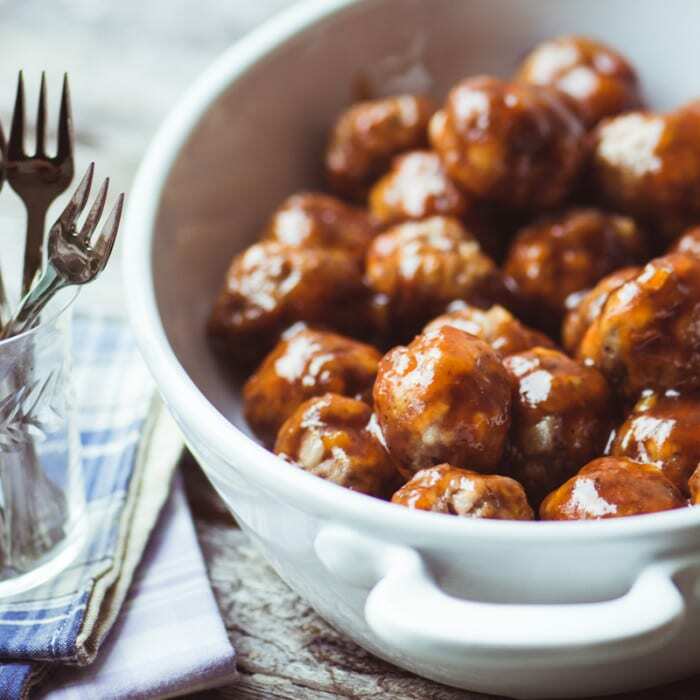 Need to make a lot of these bourbon glazed meatballs. Can they be baked on a sheet pan to brown them, or are they not as good? The recipe looks delicious! Yes, you can do that for sure, I’ve done it both ways. Enjoy! Can I use Orange Preserves instead of Apricot ? Yes, you can experiment with different preserves for sure, blackberry works good too! These are amazing! Must be a top hit when you search for Kentucky Derby ideas, because that’s when I first made them. They won the derby :) Making them again for the Super Bowl and I’m so excited. Haha, love this, thanks Katie. Basically doubled the recipe and used Pat LaFreida’s meatloaf mix from Williams-Sonoma for the meat. 4.5 ls of meatballs were decimated less than halfway though an evening appetizer potluck by 13 adults, 2 tweens and 3 wee ones. Competition was delicious yet every other item had at least a few leftovers: Berkshire pulled pork, mini Maine lobster rolls and more. This one is going in the regular appetizer rotation. Can you cook these cocktail meatballs in the crockpot? I would brown them first, and then you could finish them in the crock pot. If I brown the meatballs first and make the sauce separately, how long and on what setting (high or low) would you recommend cooking the meatballs and sauce in a crockpot? I’m not a crock pot guru, but I’d say cook them on low, for maybe 3-4 hours? All that you need to make sure of is that the meatballs get cooked through. Can these be made in a slow cooker? Yes but you’ll want to brown the meatballs first on the stove, I would think. These have got to be the best meatballs I have ever tasted. It is an awesome recipe. Made these for a Kentucky Derby party and they didn’t last to see the race!!! I made mine and then placed them in a crockpot on low, to keep them warm for the party. Absolutely a 5 star recipe. Used the extra meat for the Bourbon glazed meatloaf!!!!! Will use this throughout the year. These would be great at a Christmas party. I made these to bring to a friend’s Kentucky Derby party this afternoon. They were gone well before the race! Glad to discover your site! Made these tonight…but realized halfway thru I had no bourbon ?. They were yummy just as is. Will make them with bourbon for sure on Derby Day! ?? So funny, well, that’s good to know! Hi! I am hosting a Kentucky Derby Bunco party on Weds, and these look perfect! My question is — will the alcohol cook off and just leave flavor? I am pregnant and not sure if I should eat these or not. Thanks!! The alcohol will cook off somewhat, but not completely, Rachel, so while I personally wouldn’t be concerned, I think you should consult your doctor to be sure. Can you use whisky? Are they the same? Do you recommend doing sauce first in a pan then adding to crock pot if are slow cooking frozen ones? You can use whiskey, they’re very similar. And yes, I would make the sauce first and then add it to the slow cooker, then basically you would just be warming the meatballs up. When using Only Ground TURKEY, my Meatballs tasted a little bland. Can herbs/spices be added? Important question. I’m planning a menu for a party that will include kids and grownups. Okay for the kids to eat the meatballs too? Even with that amount of Bourbon in it? That’s your call Melanie, but I recommend making a separate dish for the kids, the bourbon is pretty pronounced in these meatballs. These are great! Tested them out this weekend for a Kentucky Derby party I’m planning for next month. They are definitely going on the menu and on my FB page so I can rave about them. I have them in a crackpot. How do of get the sauce to thicken? Take the lid off? You can remove the meatballs and turn the pot to high, with the lid off, or do it in a saucepan on the stove and put the sauce back in the crockpot John. That’s a nice amount of bourbon and with the pork in the mix I bet these are divine. Think I’ll make them large! I wish I had seen these meatballs yesterday. I made some and they were good, but your version sounds even better! That bourbon sauce sounds incredible, Sue! What a crowdpleaser! What kind of barbecue sauce do you use? Also, what brand of bourbon? As for bourbon, I use what my husband has in the cupboard, and he often buys Bulleit. But honestly any brand will do, I think. And the same sort of goes for barbecue sauce, I get what catches my eye, but I do like Stubbs, and Jack Daniel’s. Usually I like to experiment, so if I see something unusual I go for it. Great combination of the sauce with the meatballs, Sue! It is on my list for next week! 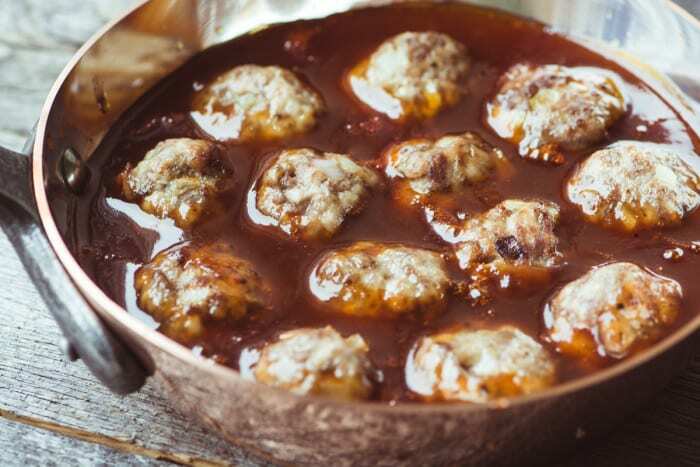 Just so to know….why do you cook the meatballs first in the skillet and then in the oven? Yes, you brown them first in the skillet, then finish cooking in the oven. Then they go into the sauce. Sensational for the holidays! I just love anything with bourbon, anything! You’ve definitely got my mouth watering before the sun’s even come up Sue! Bourbon meatballs?! What?? My husband is gonna die over these. I love that they make so many. I’ll be freezing some for sure. Thanks for the recipe! I wouldn’t have imagined Bourbon with meatballs, but reading this makes me think it must work. Ah, meatballs are like the best food ever for me. They are quick & easy to throw together and they never disappoint. I’ve never tried them with bourbon sauce, though, and yours sounds fantastic! Wow – these look pretty amazing! I love the addition of bourbon and the hot chili sauce for some heat! YUM! Oh my gosh these look absolutely delicious! What a perfect party treat! Looks like these would be brilliant in a meatball sandwich! Oh my, now you’ve got me racing out to the store to grab a nice chewy hero roll! I’m so happy I saw this, they look amazing. We are planning a party sometime just after New Year’s and this would make a great appetizer and not too time consuming to make. I love cooking with wine, brandy, now this, but then I have found so many great recipes from you! Thanks Cathy <3 Happy entertaining! These appeal to me on so many levels! I could make a meal of them without any trouble. If I get invited out this year or invite others in – I’m making these juicy little bites of yum! 1. Do you freeze the meatballs before or after baking? 2. Can I make the sauce ahead and freeze that? Well, I think you can do it either way. Freezing the cooked meatballs would be easier. And yes, you could make the sauce ahead and freeze. Could I use frozen meatballs instead of making them myself?? Thanks!!! Made these last week for a work function and they were AWESOME!! Made them Sunday, had some for dinner with mashed potatoes and carrots. The extra sauce on the potatoes was perfect! Warmed them in the crock pot the next day for work and they were nearly as good as the night before. 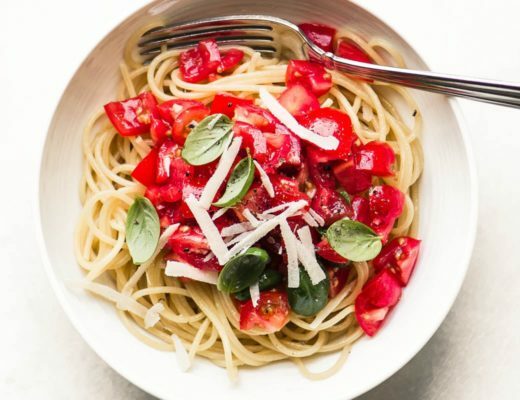 This will certainly be something I make for dinner regularly now! I made these for a cocktail party last night and they were a huge hit! There were no leftovers and my boyfriend wouldn’t allow me to dispense of the remaining sauce. What type of hot chili sauce? Sriracha? Tabasco? Thanks! You an use whatever you like, Shannon, I usually have sriracha in my fridge. Please help me. I cannot seem to pull up the recipe for “Its 5 o’clock somewhere bourbon cocktail meatballs.” I can see the ingredients, but when I click on “make it”, I just see the comments- no recipe. It’s so frustrating. I am relatively new to Pintrest, so I must be doing something wrong. I’m not sure what you mean Jj, because you’re on the post right now…but I’ll email it to you. Would these be still good if I cooked the meatballs a day in advance? I’m afraid they would not be as good, Lara, because cooked ground meat doesn’t keep very well, it gets dense and tough. You could form the meatballs ahead if you like. Actually, I made these a day in advance, reheated them in the slow cooker and they were just as good as when they were freshly made. 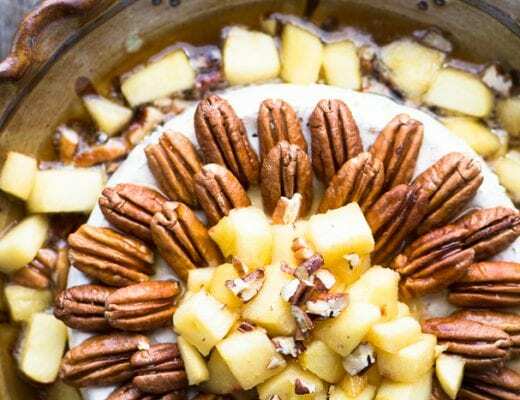 Set your slow cooker to warm and let them reheat for at least an hour. Sorry if this has already been asked… but can I use frozen meatballs?? Yours look divine but I need to save on time :) Thanks!! I haven’t tried it myself, Jenny, but you certainly could just add the sauce to the pre-made meatballs. The Friends of the Library have an annual mini-golf in the library fundraiser and this year we are adding an adult evening wine/beer tasting. This will be a perfect recipe for me to make–it makes a lot with an affordable amount of ingredients. Thank you. I like your idea of appetizers on Fridays. If I lived alone, this is how I would eat. I do buy nips at different times when I am trying a recipe. I love the mini sized bottles that a lot of the liqueurs come in. I think these would be perfect, and they don’t have to be super hot when you serve them. The only thing I would say is that meatballs, especially small meatballs, don’t do too well if made far in advance, they tend to get tough in the fridge. So I would make them just before the event! Enjoy! What kind of BBQ sauce did you use? Also, when you say this recipe makes “lots”, about how many is that? Trying to plan ahead for a party. Need to know if I should double this. As a bourbon drinker myself, I am excited to try this recipe. They look awesome! I did get a lovely whiff of bourbon as I was setting these out to eat. I couldn’t think of a way to serve these as regular meatballs, but I’m sure there’s a way. Let me know if you try them! I love these and the bourbon must make them taste fantastic. I’ll save this for our cocktail hour get-together at the pool at the condo this winter. Thanks! It’s always 5 o’clock somewhere. Can’t wait until next Friday. Ok, I’ll be envisioning you poolside when I devise my future Friday recipes! oh, my, heaven, not only did you leave me craving meatballs once again, but you managed to include all those fantastic flavors! I’ll start collecting the mini bottles with you, Sue. I LOVE having them around for holiday baking! what an excellent excellent recipe, so perfect and quite fruity tasting I imagine? and you know it’s always ‘gin-o’clock’ somewhere…. The taste is fruity, sweet, hot and smokey. I forgot to mention that lots of different jams would work, including marmalade, peach, blackberry, etc. They are—hope you give them a try! I need to do this with tofu! Bourbon, brown sugar, apricot, chili….this is like my savory mecca, right there! Love it!! Hmmmmm, not so sure about the tofu, but I’ll reserve judgement. If anyone can pull that off, you can! Just showed them to hubs, he swooned and asked if we could meet you next time we’re in LA! I die! I’m drinking bourbon right now, it’s 7pm here, I have to make these! Oh I made your brownies two hours ago – complete disaster, my fault I guestimated the butter and chocolate and they are so oily and wet, still the hubs will eat them, but I like my brownies dry, chewy and cakey.